At Lead Electrical our skilled electricians can assist with installation and upgrades to both domestic and commercial switchboards, ensuring full compliance with Australian Standard AS3439. If you are looking to install a new switchboard, our expert team are only too happy to offer advice on the best unit to suit your needs based on your requirements. Once you are ready for the work to commence, our qualified electricians will be on hand to manage installation and testing of the new system. 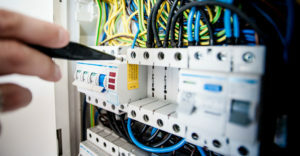 If you are operating on an old switchboard system, you should know that they bring a much higher level of risk and can lead to electrical shocks and electrical fires. If you have been experiencing faults, or are wary of the age of your system, then don’t take the risk. Invite our team of qualified electricians over to test your system and work with you on an upgrade solution.